$10.00 ODVF Badge "Ultimatum", 1923, quality REPRODUCTION. 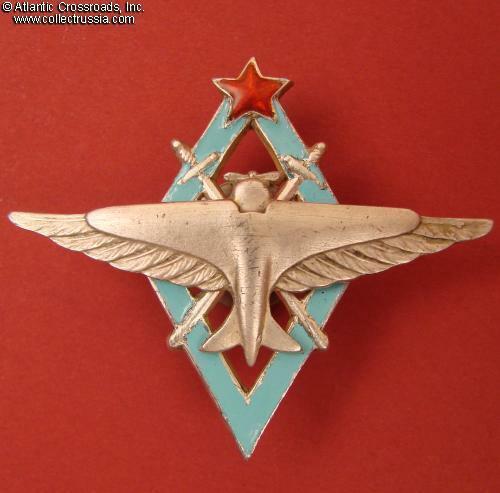 Featuring an airplane and a fist with star, the pin was given for donations to build Soviet air force. The donation drive was as a part of the propaganda campaign in response to the British 1923 note to the Soviet government (so-called "Curzon Ultimatum"). $60.00 Soviet Criminal Investigator Badge, 1920s model, High Quality Reproduction with individually stamped serial number. The original badge was in use for only a short period and is now nearly impossible to find! $29.00 Badge for Excellence in Socialist Competition of the Narkomat of Tank Manufacturing, REPRODUCTION. Superb copy stamped of brass with nice gilt and real enamel. $65.00 For Excellent Tank Weapon Shooting, REPRODUCTION. Very well made . $12.00 Excellent Sniper badge, REPRODUCTION. Very precise copy in "aged" brass and enamels, with correct screw plate and replica "NKPS" screw plate. $19.00 Excellent Tanker badge, REPRODUCTION. $19.00 Excellent Torpedo Artificer badge, REPRODUCTION. Very well made copy with authentic looking "patina". $19.00 Excellent Mine Layer badge, REPRODUCTION	High quality, very realistic including brass patina. $19.00 Excellent Combat Engineer (Sapper), REPRODUCTION. $19.00 Excellence in Railway Troops badge, REPRODUCTION. $14.00 Excellent Reconnaissance Scout badge, REPRODUCTION. $19.00 Excellence in Signal Corps badge, REPRODUCTION. $19.00 Excellent Pontoon Bridge Builder badge, quality REPRODUCTION. $19.00 Excellence in Antiaircraft Gunnery badge, REPRODUCTION. $19.00 Excellence in Road Construction badge, REPRODUCTION. $19.00 Excellent Driver badge, REPRODUCTION. $19.00 Excellent Baker badge, REPRODUCTION. $19.00 Excellent Fire Fighter badge, REPRODUCTION. $19.00 Excellent in the Air Force badge, REPRODUCTION. $15.00 Airborne School graduate badge, "1950s type", REPRODUCTION. $9.00 Fuel and Lubricants Supply School graduate badge, "1949", REPRODUCTION. $75.00 Military Pilots School badge, for graduating with honors, REPRODUCTION. $70.00 Military Pilots School graduation badge, REPRODUCTION	. $9.00 Badge for 70th Anniversary of KGB, REPRODUCTION. Very well-made.